Eve has a problem with clutter. Too much stuff and too easily acquired, it confronts her in every corner and on every surface in her house. When she pledges to tackle the worst offender, her horror of a 'Hell Room,' she anticipates finally being able to throw away all of the unnecessary things she can't bring herself to part with: her fifth-grade report card, dried-up art supplies, an old vinyl raincoat. But what Eve discovers isn't just old CDs and outdated clothing, but a fierce desire within herself to hold on to her identity. Our things represent our memories, our history, a million tiny reference points in our lives. If we throw our stuff in the trash, where does that leave us? And if we don't . . . how do we know what's really important? Everyone has their own Hell Room, and Eve's battle with her clutter, along with her eventual self-clarity, encourages everyone to dig into their past to declutter their future. 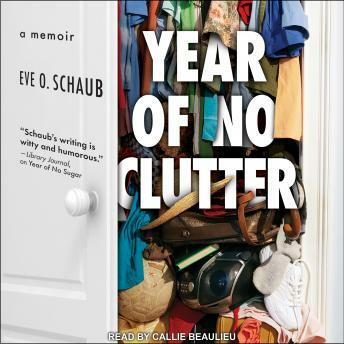 Year of No Clutter is a deeply inspiring-and frequently hilarious-examination of why we keep stuff in the first place, and how to let it all go.